Payment Cycle: Either Monthly or Annually will appear next to this option, depending upon whether you hold a legacy monthly subscription (purchased prior to June 5, 2018) or a recurring annual subscription with SoGoSurvey. You can change the Billing Cycle by clicking on the Upgrade button to its left. Billing Cycle: This option displays the time of the month or year when your account is set to renew automatically. If the billing cycle shows 29th or 30th or 31st of every month and a month has less than 29 or 30 or 31 days, we will automatically charge you on the last day of the month. Next Due Date: This option displays the next date when your account will be automatically renewed. Card Type: Whether you have used a MasterCard or Visa credit card for subscribing to SoGoSurvey, the respective option will be selected by default. First Name and Last Name: The name associated with your SoGoSurvey account will be displayed here. Card Number: The last four digits of your registered credit card will be displayed here. Expiration Date: The month and year of expiry of your registered credit card will be displayed here. Billing Email: The email address registered with your SoGoSurvey account will be displayed here. Address: The mailing address registered with your SoGoSurvey account will be displayed here. ZIP/Postal Code: The ZIP/Postal code of your address will be displayed here. State/Province: The State/Province of your address will be displayed here. Country: The country you reside in will appear under this section. Click on your account name in the top right corner, then choose Settings from the dropdown menu. Select Billing Information from the options on the left. 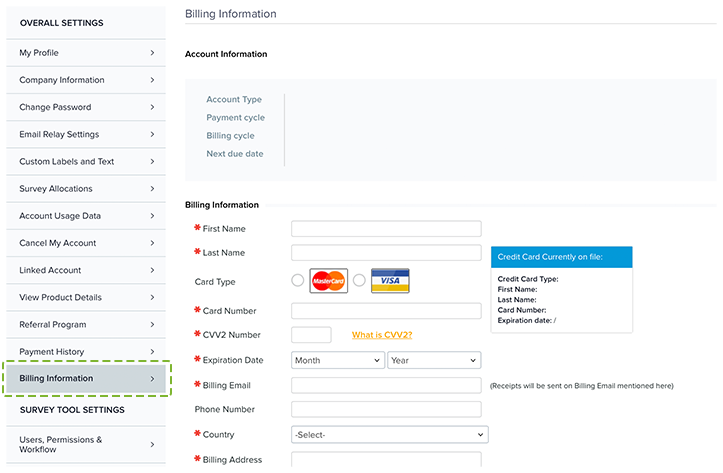 To modify any of the above options (except Billing Cycle and Next Due Date), click on the Edit button at the top right corner. Click Update to confirm any changes.